Lactic Acid Peel 30 treatment is a mild chemical peel that is designed to even out the top layer of the epidermis while gently stimulates the collagen. It also aids in delivering potent antioxidants and anti-inflammatories to prevent free radical damage and irritations. It is a great peel for a gentle chemical exfoliation and for those representing the first signs of aging. 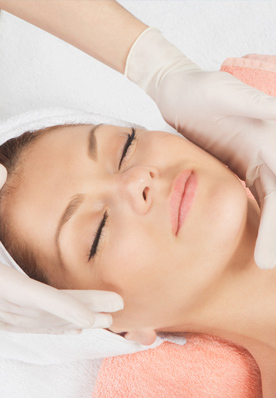 Glycolic Acid Peel 30 treatment is a restorative peel that is designed for those in need of deep exfoliation. It is a medium to deep chemical peel that aids in epidermal leveling through the use of glycolic acid 30%, EGCG as a Collagenase inhibitor and GALA as an antioxidant. It is a great peel for those with fine lines starting to deepen, deep lines and wrinkles. Salicylic Acid Peel 30 treatment is designed to exfoliate, relieve clogged pores and helps to eliminate the redness and swelling associated with acne. The treatment contains Salicylic Acid 2%, Mandelic Acid 24%, and Glycolic Acid 4% to aid in inhibiting the growth of acne causing bacteria. The treatment also contains Sabiwhite to aid in skin whitening and brightening. University Place & 14th St.